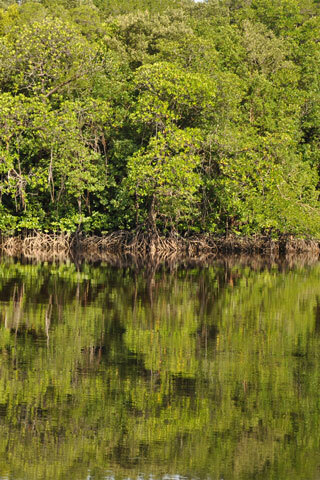 Mangrove tours can vary in flavour, from a simple boat ride on the water to a more interesting look at the diverse fauna and flora, depending on your guide. Browse places to stay in Cherating on Booking.com. Book Now - Pay Only When You Stay. While the mangroves here are not nearly as impressive (nor as expansive) as those at Langkawi, the mangroves at Cherating are worth experiencing. Payung Guesthouse is the most popular backpacker operator that runs these trips with both daytime and evening firefly spotting trips available. It is also possible to hire a kayak and go check them out yourself if you prefer. Both the evening cruise and day cruise along the mangroves costs 30 ringgit per person while if you want to do it by kayak it will cost 15-30 ringgit per kayak for three hours. The firefly tour is available year round and well worth taking. Although there are other operators in the area, Mr Hafiz, of Hafiz Cherating Activities, is the Firefly whisperer of the area. His nightly tours include a short but passionate classroom introduction to fireflies followed by an hour boat ride through the dark river waters. The tour itself seems to embrace a touch of Malaysian magic in luring the tiny insects into performing their nightly light show, but when they show they arrive in full force often landing on the guests. Reservations are not necessary, but recommended on weekends and holidays. Tours run Tuesday to Sunday at 19:30.